The rent at Magnolia Apartments ranges from $1,550 for a one bedroom to a $2,149 two bedroom. Apartments in this building are about 6% less expensive than the Lawton Park average. This is a pet-friendly apartment. This apartment is in the Lawton Park neighborhood in Seattle. Nearby parks include Magnolia Manor Off Leash Dog Park, Magnolia Manor Reservoir Lid Park and West Magnolia Park. Magnolia Apartments has a Walk Score of 66 out of 100. This location is Somewhat Walkable so some errands can be accomplished on foot. 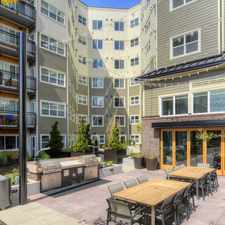 Welcome to your new home at Magnolia Apartments in Seattle, WA! Nestled in the heart of Seattle, Magnolia Apartments offers all the rewards and comforts of high-class living. Whether it be a relaxing night of beautiful Seattle views or a night out on the town, Magnolia Apartments gives you the neighborhood you're looking for at the price you want. We offer pet-friendly 1 and 2 bedroom floor-plans just minutes from Seattle's finest shopping and dining, you get the benefits of city living, combined with comforting amenities. Explore how far you can travel by car, bus, bike and foot from Magnolia Apartments. Magnolia Apartments has some transit which means a few nearby public transportation options. Car sharing is available from Zipcar. 2727 W Manor Pl compared to all of Seattle. How do you feel walking near 2727 W Manor Pl? Magnolia Apartments is in the Lawton Park neighborhood. Lawton Park is the 62nd most walkable neighborhood in Seattle with a neighborhood Walk Score of 61.